Purpose: Chronic low back pain is highly prevalent and often treatment recalcitrant condition, particularly among workers’ compensation patients. There is a need to identify psychological factors that may predispose such patients to pain chronicity. The primary aim of this study was to examine whether pain acceptance potentially mediated the relationship between pain catastrophizing and post-surgical outcomes in a sample of compensated lumbar fusion patients. Patients and methods: Patients insured with the Workers Compensation Fund of Utah and who were at least 2 years post-lumbar fusion surgery completed an outcome survey. These data were obtained from a prior retrospective-cohort study that administered measures of pain catastrophizing, pain acceptance, mental and physical health, and disability. Results: Of the 101 patients who completed the outcome survey, 75.2% were male with a mean age of 42.42 years and predominantly identified as White (97.0%). The majority of the participants had a posterior lumbar interbody fusion surgery. Pain acceptance, including activity engagement and pain willingness, was significantly correlated with better physical health and mental health, and lower disability rates. Pain catastrophizing was inversely correlated with measures of pain acceptance (activity engagement r=–0.67, p<0.01, pain willingness r=–0.73, p<0.01) as well as the outcome measures: mental health, physical health, and disability. Pain acceptance significantly mediated the relationship between pain catastrophizing and both mental and physical health and also the relationship between pain catastrophizing and disability. Conclusion: This study demonstrated that the relationship between pain catastrophizing and negative patient outcomes was potentially mediated by pain acceptance. Understanding this mediating relationship offers insight into how pain acceptance may play a protective role in patients’ pain and disability and has potential implications for pain treatments. Chronic pain has been defined as pain that lasts longer than 3 months and often persists after normal tissue healing.1 Chronic pain is often associated with depression, high health care costs, and loss of productivity.2,3 At least 100 million adult Americans have chronic pain, which is estimated to cost between US$560 to $635 billion annually.4 Back pain was the most frequent type of pain reported in the 2010 National Health Information Survey, with 29% of people experiencing back pain in the past 3 months.5 Chronic pain often co-occurs with mental health challenges, particularly anxiety and depression.6,7 As a result of these costs and potential negative outcomes, there is considerable interest in identifying potential psychosocial factors that may magnify a person’s propensity to experience chronic pain. Among the psychological factors that can influence the chronicity of pain is pain catastrophizing. Pain catastrophizing is when one experiences exaggerated worrying and overestimation of the probability of unpleasant outcomes in response to pain.8 Previous research has demonstrated that pain catastrophizing is related to increased distress, disability, and pain intensity.8–11 Pain is often construed as threatening and is believed to lead to pain-related fear which leads to avoidance and hypervigilance.12 Avoidance and fear resulting from pain catastrophizing leads to issues with avoiding and controlling pain and not engaging in activities where pain is present. This fear-avoidance cycle further exacerbates subjective pain experience and overall disability.11,12 While some degree of pain catastrophizing is expected in most chronic pain conditions, emerging evidence suggests certain individuals may be able to minimize its negative impact on their lives. The relationship between pain catastrophizing and pain outcomes may be best explained by conceptualizing pain acceptance as a mediator. There have been a few studies that have examined pain acceptance as a mediator or moderator with a variety of factors, including pain intensity, attention to pain, pain catastrophizing, and various other outcomes.18–21 For example, in a study of patients with chronic pain presenting for treatment, lower pain acceptance was found to mediate the relationship between pain catastrophizing and depression, pain anxiety, and physical disability but not with pain intensity or physical tasks.18 A study of chronic arthritic pain patients using electronic diary assessment of chronic pain found that pain acceptance moderated the relationship between pain intensity and fearful thinking about pain although did not moderate the relationship between pain intensity and attention to pain.19 Such preliminary results indicate that poor functioning in chronic pain patients may not necessarily be the direct product of pain catastrophizing but rather is mediated by other mental processes, like pain acceptance. Some potential weaknesses of the aforementioned studies are inclusion of a number of diverse pain conditions (eg, spine, arthritis, upper/lower extremity pain) and a lack of patients with more severe chronic pain conditions. Given the paucity and preliminary nature of these findings, it appears important to explore these mediational relationships in more specific and severe chronic pain populations. Examining pain acceptance and pain catastrophization in a compensation population may offer clues to why such patients are at increased risk for disability and poor outcomes following surgery. Further, understanding the mediating relationship among these variables within this population may also provide justification for incorporating interventions to enhance pain acceptance into behavioral pain interventions. Therefore, the primary purpose of this study was to determine whether pain acceptance mediated the relationship between pain catastrophizing and post-surgical disability and health-related quality of life outcomes in a sample of Utah Workers’ Compensation lumbar fusion patients. Patients eligible for inclusion in this study underwent elective lumbar fusion surgery between 1998 and 2007 and were at least 2 years beyond surgery at the time of the outcome evaluation. Lumbar fusion was the result of a low back injury sustained in the workplace. Using an administrative claims database, patients were identified via current procedural terminology codes for lumbar fusion. Workers who were self-employed or covered by federal workers’ compensation programs were not included because of inaccessible data. The WCFU insures approximately 60% of Utah workers. A total of 101 patients completed the telephone outcome measures and were included in the current study. Pre-surgical medical record data were gathered via independent and standardized review of digital medical records contained within WCFU computer databases. The data abstractor was a trained doctoral student who routinely met with authors to review and resolve coding discrepancies. 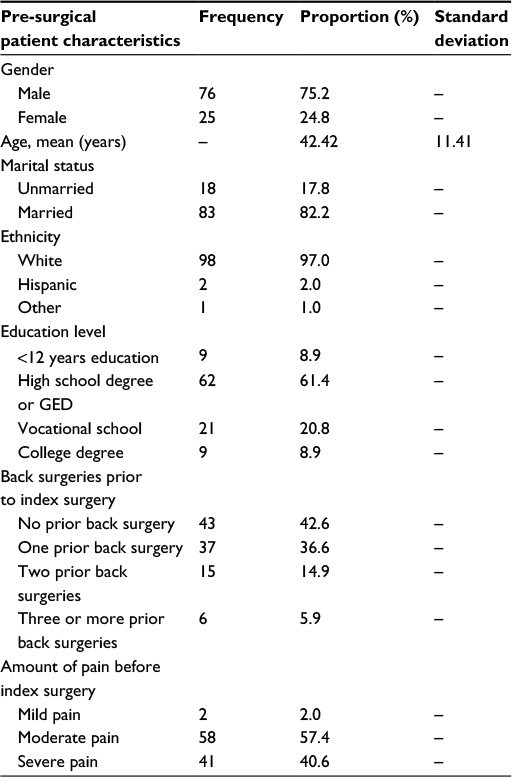 For purposes of the present study, five demographic variables (gender, age, marital status, ethnicity, and educational level) and two additional pre-surgical variables (history of back surgeries prior to the index lumbar fusion and amount of pain prior to the index lumbar fusion) were included in order to characterize the patient sample. The latter two variables were obtained via a standardized pre-operative report. The patient outcome survey used in the telephone interview was administered at the initial time of contact unless participants requested to not participate or to participate at a later scheduled time. Three doctoral students who had no treatment contact with the patients conducted the telephone outcome surveys. The interviewers were trained in basic interviewing skills and provided with a detailed written script to follow when conducting the survey. All the surveys were completed in one session approximately 20–75 minutes long. Disability status was determined by asking participants whether or not they were deemed totally and permanently disabled due to their back condition by the State of Utah at the time of follow-up (coded yes/no). A person with this classification will likely never return to work and will receive lifetime compensation and medical benefits from the WCFU. All statistical analyses were performed using IBM Statistical Package for the Social Sciences (SPSS) Statistics, version 23 (IBM Corporation, Armonk, NY, USA). Descriptive statistics were carried out to provide an overview of means and frequencies of patient characteristics. Prior to analysis, the data were examined for missing values and descriptive statistics for all the study measures were calculated and assessed for normality. There were no missing values or outliers. The data were found to meet required assumptions including linearity, homoscedasticity, and normality, except for the dichotomous variable of disability status which is why logistic regression was utilized. Bivariate correlations were calculated between pain catastrophizing and pain acceptance with patient outcomes. In order to determine if pain acceptance mediated the relationship between pain catastrophizing and patient outcomes, the PROCESS macro for SPSS was utilized.31 This macro uses ordinary linear least squares or logistic regression-based path analytic framework to estimate statistical mediation via conditional process modeling. Bootstrapping, a non-parametric test that does not violate assumptions of normality and is recommended for small sample sizes, was utilized to assess indirect effects.32,33 If zero is not in the 95% bootstrap confidence interval (CI) then the indirect effect, meaning the effect that is mediated by pain acceptance, is significantly different from zero at p<0.05. Reverse mediation models were also calculated in which the mediator and the outcome variables were exchanged. If such reverse models result in substantial changes in mediation effects, particularly reductions or complete nullification of mediation effects, then this can be construed as some additional support for the specified model. Workers compensation patients who met the inclusion criteria and completed the telephone outcome assessments were identified (n=101). 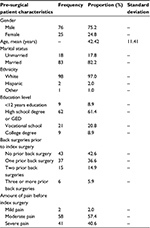 The majority of participants had prior WCFU claims (60.4%) and most had not had a prior back surgery (74.3%). The means and frequencies of patient characteristics and surgical variables are included in Table 1. Abbreviations: ‘–’, no data; GED, General Educational Development Certification. Abbreviations: PCS, Pain Catastrophizing Scale; CPAQ, Chronic Pain Acceptance Questionnaire; RMDQ, Roland Morris Disability Questionnaire; SF-36, Short Form Health Survey; SD, standard deviation. Correlations between the AE and PW subscales of pain acceptance and post-surgical outcomes are presented in Table 3. As expected, AE and PW were significantly positively related (r=0.62, p<0.01). Both AE and PW were significantly correlated with better physical health and mental health and lower disability rates. 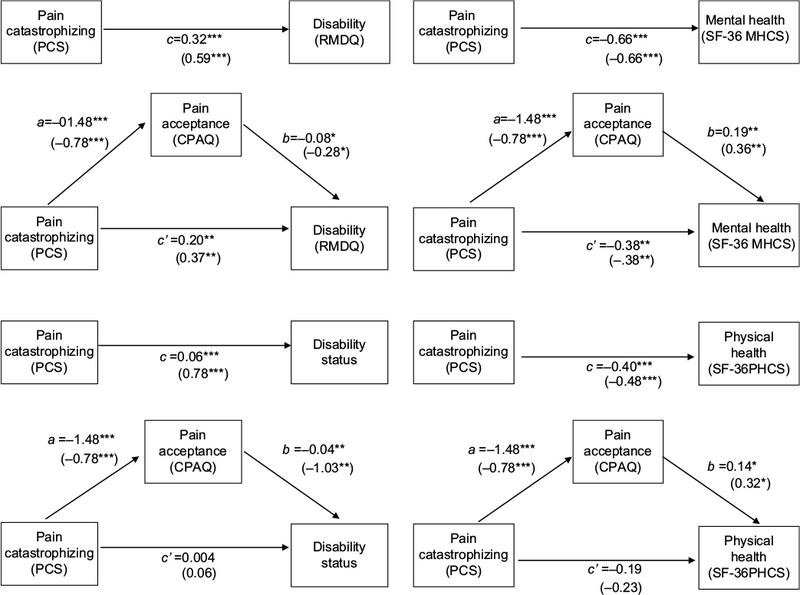 Pain catastrophizing was also inversely correlated with measures of pain acceptance (AE r=–0.67, p<0.01, PW r=–0.73, p<0.01) as well as the following outcome measures: mental health, physical health, and disability. Abbreviations: PCS, Pain Catastrophizing Scale; R, rumination; M, magnification; H, helplessness; AE, activity engagement; PW, pain willingness; RMDQ, Roland Morris Disability Questionnaire; SF-36, Short Form Health Survey. Several mediational analyses were conducted using logistic regression or ordinary least squares path analysis and the results are given in Table 4 and Figure 1. A mediation analysis found pain catastrophizing indirectly influenced disability level (RMDQ) and disability status through its effect on pain acceptance (Figure 1). As expected, higher levels of pain catastrophizing were related to lower levels of chronic pain acceptance (a=–1.48, p<0.001). Higher chronic pain acceptance was negatively related to worse disability level (RMDQ) (b=–0.08, p<0.05). Also, those receiving disability for their back pain tended to have higher acceptance scores (b=–0.04, p<0.01). Nonparametric bootstrapping analyses were used to test chronic pain acceptance as the mediator between pain catastrophizing and disability.28 A 95% bias-corrected bootstrap CI for the indirect effect based on 5,000 bootstrap samples was entirely above zero for both self-rated disability and whether they were receiving disability or not (Table 4). Because zero is not in the 95% CI, this supports the conclusion the indirect effect is positive, meaning there was evidence of pain acceptance as a mediator. The introduction of pain acceptance produced a significant mediation effect and reduced the effect of pain catastrophizing on whether someone received disability for their back pain (c’=0.01 p=0.878). However, pain catastrophizing remained a significant predictor of disability level (RMDQ), not through pain acceptance (c’=0.20, p=0.005). Notes: aWhen CI does not contain zero indirect effect is significant. Abbreviations: CI, confidence interval; RMDQ, Roland Morris Disability Questionnaire; SF-36, Short Form Health Survey; SE, standard error. Figure 1 Mediation models for pain acceptance with unstandardized coefficients and standardized coefficients in parentheses. Notes: Indirect effect = a,b. Direct effect of pain catastrophizing on outcome (controlling for acceptance) = c’. Total effect of pain catastrophizing on outcome =c.*p≤0.05. **p≤0.01. ***p≤0.001. Abbreviations: CPAQ, Chronic Pain Acceptance Questionnaire; MHCS, Mental Health Composite Scale; PHCS, Physical Health Composite Scale; PCS, Pain Catastrophizing Scale; RMDQ, Roland Morris Disability Questionnaire; SF-36, Short Form Health Survey. The extent pain catastrophizing influences mental health or physical health through pain acceptance was also examined (Figure 1). Higher levels of pain acceptance predicted high mental health (b=0.19, p<0.01) and physical health (b=0.14, p<0.05). Table 4 shows the bootstrap CIs for mental health and for physical health and for both the indirect effect is significantly different from zero. This indicates pain acceptance significantly mediated the relationship between pain catastrophizing and both mental and physical health. However, pain catastrophizing remained a significant predictor, not through pain acceptance, for mental health (c’=–0.38, p= 0.002). The introduction of pain acceptance produced a significant mediation effect and reduced the effect of pain catastrophizing on physical health to non-significance (c’=–0.19, p=0.098). Reverse models of mediation were also run. Only mental health and back pain related dysfunction (RDMQ) demonstrated statistically significant, but significantly reduced mediation effects in reverse models. The other alternative models showed no significant mediational relationships among the variables. 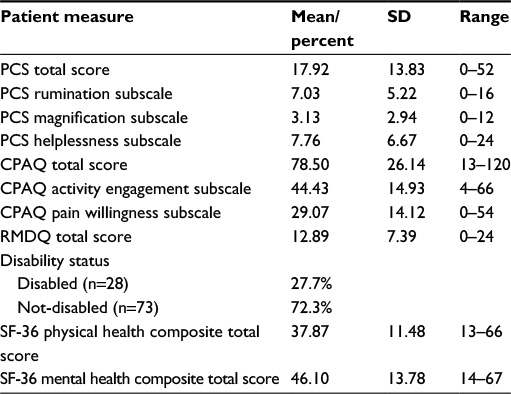 As expected, higher CPAQ pain acceptance subscales scores (AE and PW) were strongly associated with less disability and greater mental and physical health-related quality of life. Alternatively, pain catastrophizing was related to increased disability and poorer perceived health. The large magnitude of these correlations indicate that pain acceptance and pain catastrophizing are two important variables that predict outcomes in a post-surgical compensation population. Pain catastrophizing and pain acceptance are likely both important psychological factors in terms of the onset and chronicity of a pain experience and may be important factors to address in chronic low back pain treatments. While pain catastrophizing and pain acceptance are related to each other, pain catastrophizing involves more cognitive elements while pain acceptance incorporates behavioral elements. Both pain acceptance and pain catastrophizing are unique contributors to outcomes for those with chronic low back pain. This study demonstrated the relationship between pain catastrophizing and negative patient outcomes was at least partly a function of pain acceptance. In general, the more willing a person was to experience their pain, the less pain catastrophizing was associated with negative outcomes. This is consistent with a prior study that found pain acceptance diminishes the impact of pain catastrophizing on functioning.21 It also supports another study’s finding that variance in functioning with chronic pain predicted by pain catastrophizing was decreased once pain acceptance was included.18 In light of the partial mediation observed in half of the analyses, it is certainly possible that many other variables aside from acceptance could further explain the relationship between pain catastrophizing and outcomes (eg, somatization, depression, and anxiety). As pain acceptance appears to help explain the relationship between pain catastrophizing and negative outcomes it seems to illustrate the importance of considering a contextual and functional view of thoughts, behavior, and pain. Treatments that targets increasing pain acceptance may be more beneficial than traditional cognitive approaches that focus primarily on modifying maladaptive thoughts relative to pain (eg, pain catastrophizing).19,30,34,35 Acceptance-based treatments, such as acceptance and commitment therapy,36 have begun to emerge as alternative methods to address inner experiences, such as thought, feelings, and physical sensations. These approaches place little emphasis on changing the content of thoughts, but instead emphasize acceptance of thoughts, feelings, and bodily sensations. Such treatments are consistent with a psychological flexibility model for chronic pain, or the ability to adapt to situations with more awareness, openness, and focus, and to take effective action, guided by values.30 The main focus, therefore, is not to eliminate pain or even necessarily reduce painful psychological symptoms or sensations, but rather to decrease their functional impact, thereby allowing changes in the way one lives. The current study supports the psychological flexibility model for chronic pain and offers implications for exploring the utility of acceptance based treatments in a post-surgical population. There were significant limitations in the current study that should be noted. First, this study was a cross-sectional design with mediation analyses making causation inferences among variables not possible. Second, the generalizability of the sample finding may be limited by the participants being post-lumbar surgery. However, one strength of this study was that it examined a more severe population, which tend to have worse outcomes, and found a strong relationship between pain acceptance as a mediator that could lead to better outcomes. The findings of this study also add to other studies with similar findings17,20 for the role of pain acceptance as a mediator. Additionally, this study helps build a theoretical model for explaining the established relationship between pain catastrophizing and negative outcomes, such as disability. Future research should examine how acceptance-based psychological treatments for patients with higher levels of pain catastrophizing would impact post-surgery disability, medical and mental health outcomes. [No author]. Chronic pain. NIH MedlinePlus: The Magazine. 2011;6(1):4–9. Breivik H, Collett B, Ventafridda V, Cohen R, Gallacher D. Survey of chronic pain in Europe: prevalence, impact on daily life, and treatment. Eur J Pain. 2006;10(4):287–333. Johannes CB, Le TK, Zhou X, Johnston JA, Dworkin, RH. The prevalence of chronic pain in United States adults: results of an Internet-based survey. J Pain. 2010;11(11):1230–1239. Simon LS. Relieving pain in America: A blueprint for transforming prevention, care, education, and research. J Pain Palliat Care Pharmacother. 2012;26(2):197–198. Schiller JS, Lucas JW, Ward BW, Peregoy JA. Summary health statistics for US adults: National Health Interview Survey, 2010. Vital Health Stat. 2012;252:1–207. McWilliams LA, Cox BJ, Enns MW. Mood and anxiety disorders associated with chronic pain: an examination in a nationally representative sample. Pain. 2003;106(1):127–133. Hoy D, Brooks P, Blyth F, Buchbinder R. The epidemiology of low back pain. Best Pract Res Clin Rheumatol. 2010;24(6):769–781. Sullivan MJ, Thorn B, Haythornthwaite JA, et al. Theoretical perspectives on the relation between catastrophizing and pain. Clin J Pain. 2001;17(1):52–64. Turner JA, Mancl L, Aaron LA. Pain-related catastrophizing: a daily process study. Pain. 2004;110(1–2):103–111. Turner JA, Jensen MP, Warms CA, Cardenas DD. Catastrophizing is associated with pain intensity, psychological distress, and pain-related disability among individuals with chronic pain after spinal cord injury. Pain. 2002;98(1–2):127–134. Reneman MF, Dijkstra A, Geertzen JH, Dijkstra PU. Psychometric properties of chronic pain acceptance questionnaires: a systematic review. Eur J Pain. 2010;14(5):457–465. McCracken LM, Vowles KE, Eccleston C. Acceptance of chronic pain: component analysis and a revised assessment method. Pain. 2004;107(1–2):159–166. McCracken LM, Eccleston C. A comparison of the relative utility of coping and acceptance-based measures in a sample of chronic pain sufferers. Eur J Pain. 2006;10(1):23–29. Cheung MN, Wong TC, Yap JC, Chen PP. Validation of the Chronic Pain Acceptance Questionnaire (CPAQ) in Cantonese-speaking Chinese patients. J Pain. 2008;9(9):823–832. Wicksell RK, Olsson GL, Melin L. The Chronic Pain Acceptance Questionnaire (CPAQ)-further validation including a confirmatory factor analysis and a comparison with the Tampa Scale of Kinesiophobia. Eur J Pain. 2009;13(7):760–768. Vowles KE, McCracken LM, Eccleston C. Patient functioning and catastrophizing in chronic pain: the mediating effects of acceptance. Health Psychol. 2008;27(2S):S136–S143. Crombez G, Viane I, Eccleston C, Devulder J, Goubert L. Attention to pain and fear of pain in patients with chronic pain. J Behav Med. 2013;36(4):371–378. Kratz AL, Davis MC, Zautra AJ. Pain acceptance moderates the relation between pain and negative affect in female osteoarthritis and fibromyalgia patients. Ann Behav Med. 2007;33(3):291–301. Richardson EJ, Ness TJ, Doleys DM, Baños JH, Cianfrini L, Richards JS. Catastrophizing, acceptance, and interference: laboratory findings, subjective report, and pain willingness as a moderator. Health Psychol. 2010;29(3):299–306. Gatchel RJ, Polatin PB, Mayer TG. The dominant role of psychosocial risk factors in the development of chronic low back pain disability. Spine (Phila Pa 1976). 1995;20(24):2702–2709. Rainville J, Sobel JB, Hartigan C, Wright A. The effect of compensation involvement on the reporting of pain and disability by patients referred for rehabilitation of chronic low back pain. Spine (Phila Pa 1976). 1997;22(17):2016–2024. Atlas SJ, Tosteson TD, Blood EA, Skinner JS, Pransky GS, Weinstein JN. The impact of workers’ compensation on outcomes of surgical and nonoperative therapy for patients with a lumbar disc herniation SPORT. Spine (Phila Pa 1976). 2010;35(1):89–97. Harris I, Mulford J, Soloman M., van Gelder JM, Young J. Association between compensation status and outcome after surgery: a meta-analysis. JAMA. 1995;293(13):1644–1652. Tait RC, Chibnall JT. Workers’ compensation claimants with low back pain: the role of dissatisfaction in the transition to disability. Psychol Inj Law. 2016;9(1):16–22. Cuneo JG, DeBerard MS, Wheeler AJ. Lumbar fusion in Utah workers’ compensation patients: changing outcomes across a decade. Spine (Phila Pa 1976). Available from: https://www.ncbi.nlm.nih.gov/pubmed/27779603. Accessed December 20, 2016. Roland M, Morris R. A study of the natural history of back pain: Part I: development of a reliable and sensitive measure of disability in low-back pain. Spine (Phila Pa 1976). 1983;8(2):141–144. Roland M, Morris R. A study of the natural history of low-back pain. Part II: development of guidelines for trials of treatment in primary care. Spine (Phila Pa 1976). 1983;8(2):145–150. Ware JE, Kosinski M, Dewey JE, Gandek B. SF-36 Health Survey: Manual and Interpretation Guide. Lincoln, RI: QualityMetric Inc; 2000. Hayes AF. Beyond Baron and Kenny: statistical mediation analysis in the new millennium. Commun Monogr. 2009;76(4):408–420. Preacher KJ, Hayes AF. SPSS and SAS procedures for estimating indirect effects in simple mediation models. Behav Res Methods Instrum Comput. 2004;36(4):717–731. Sullivan MJ. The Pain Catastrophizing Scale. User Manual [cited 2009]. Available from: http://sullivan-painresearch.mcgill.ca/pcs1.php. Accessed October 14, 2013. McCracken LM, Morley S. The psychological flexibility model: a basis for integration and progress in psychological approaches to chronic pain management. J Pain. 2014;15(3):221–234. Hayes SC, Strosahl K, Wilson KG. Acceptance and Commitment Therapy: An Experiential Approach to Behavior Change. New York, NY: Guilford Press; 1999.